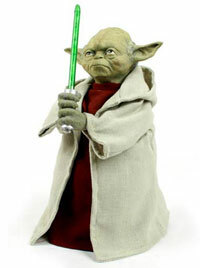 The Yoda Christmas tree topper is ready for pre-order ($40. ouch). I have no interest in buying one. I just want to see what this thing looks like on top of a Christmas tree. No where on the internet can I find such a photo. And I don’t want to invest the time to photoshop this thing on top of a tree. oh well. They should have at least put a santa hat on him. Or they could have made his lightsaber look like a candycane or something like that. It would have made Yoda seem more festive. I love yoda very much. But if someone has this as their offical tree topper, I would be really sad. Then again, I haven’t had a Christmas tree in five years. this product is currently unavailable… oh no! I kind of like it.